Tell City’s first community cemetery was formally dedicated on Sunday, June 15, 1862. For more than a year, the city’s leaders acquired land initially set aside by the Swiss Colonization Society as a marketplace. Originally, grave sites were laid out for people under 12 years of age, adults, families, and individuals. The first person to be buried in the newly-created cemetery was four-month-old Mary Magdaline Schubert on June 3, 1862; while several weeks later, John Fricke, age 21, was the first adult to be buried. By 1926, all available lots had been sold and the City Council embarked on Greenwood Cemetery’s first expansion along with adding paved streets, curbing, and formal landscaping. 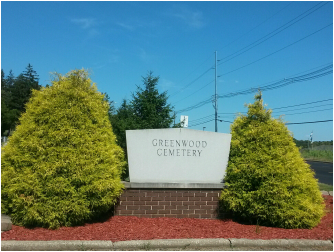 Since then, Greenwood Cemetery has been expanded to seven sections. The first mausoleum was constructed in ​2002, with space set aside for three more. Plans are currently being developed to enclose the mausoleum area so that funeral services can be conducted regardless of weather conditions. In 2007, a (40) niche columbarium was constructed and is available.